Welcome to Moonlit Taj which, with its elegant scrolling turquoise, lapis and deep green vines set against a milky white ground, is making a comeback this season. 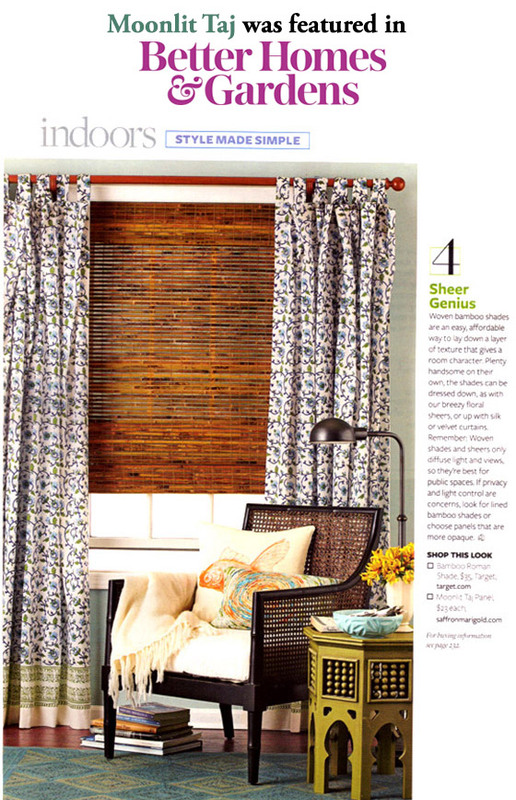 Sheer Genius: Woven bamboo shades are an easy, affordable way to lay down a layer of texture that gives a room character. Plenty handsome on their own, the shades can be dressed down, as with our breezy floral sheers, or up with silk or velvet curtains. The Moonlit Taj is inspired by the pietra dura (marble inlay) work on the walls of the magnificent Taj Mahal. Characteristic of the gem encrusted floral inlay work seen on the walls of the Taj Mahal, the pattern consists of a graceful waltz of scrolling lapis, turquoise and malachite vines set against a ground of milky white marble. Use Moonlit Taj to capture the legendary romance and timelessness that embodies the 17th century architectural masterpiece that was built by the emperor Shah Jahan as a sublime monument devoted to the memory of his wife Mumtaz Mahal. I love my new curtains! 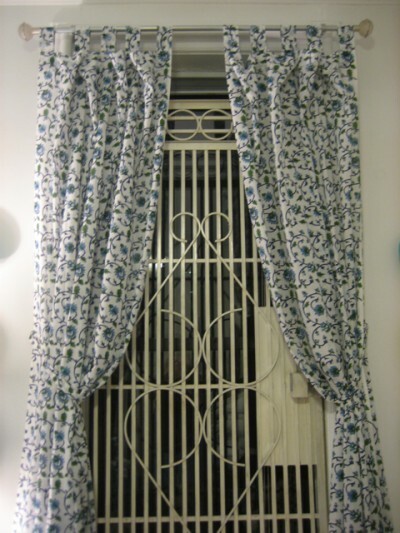 When I first started shopping for curtains, I’d planned to get a solid, but I kept coming back to these. The colors in the Moonlit Taj pattern are perfect, and the design is so much more interesting than a solid would have been. My favorite part, though, is how beautifully they move when there’s a breeze. The packaging was very nice, but the contents were even better. 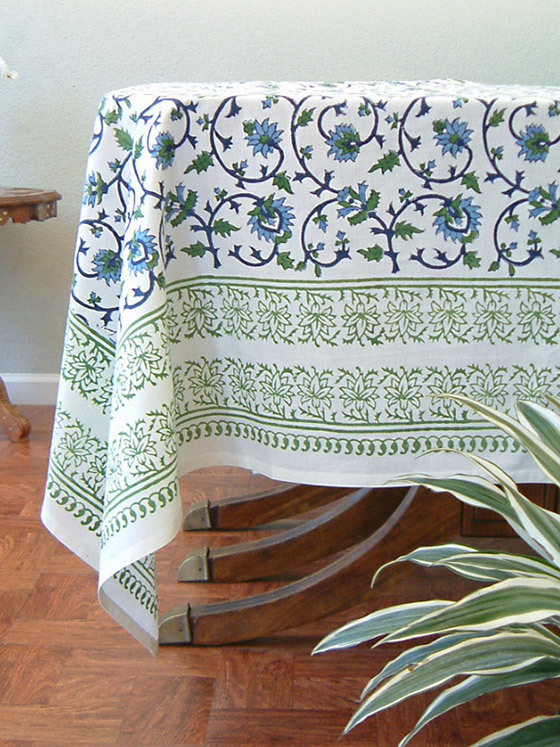 I ordered the Moonlit Taj lightweight bedspread with two shams and I am delighted with my purchase! The design and colors are beautiful and refreshing in our blue and white bedroom. All the bedding stores in my area offer heavy quilts and comforters – even in our super hot summers! 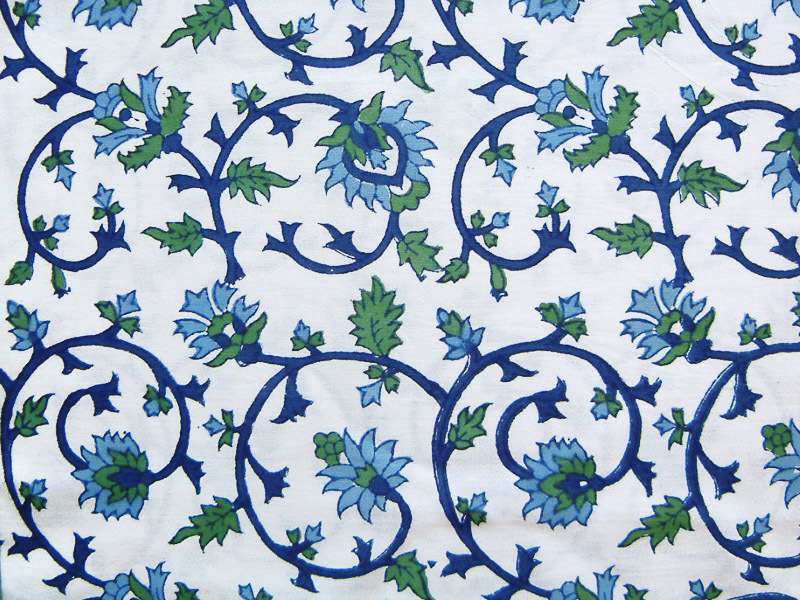 So I am happy to find a company that sells high-quality lightweight cotton bedspreads. I am totally satisfied and highly recommend Saffron Marigold! 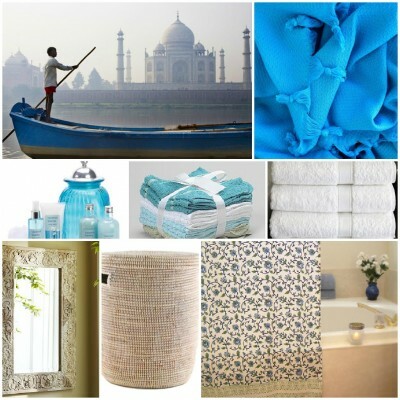 My husband and I love our new Moonlit Taj Duvet Cover from Saffron Marigold. It is even more beautiful than the sample! The colors and pattern are luminous, harmonious, and full of grace and charm. We can see and feel the care and skill in the craftsmanship of the piece. It is giving us much joy. Blue sunny skies, and the smell of freshly cut grass… these are summer wrapped up with a bow. 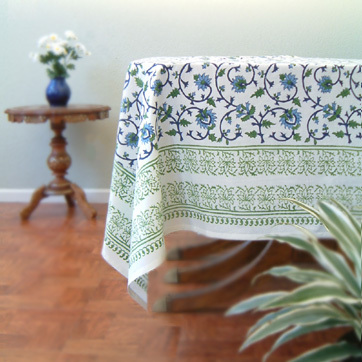 These are also the colors of Moonlit Taj, and make this tablecloth a gorgeously fresh palette for your summer entertaining. Keep the look clean and bright with blues and whites, and add in a few bursts of warm color for a style that’s easy and cool even in the hottest of months. → Know someone who is going back to college?